Whether driving a golf ball deep down the center of a fairway, flipping high in the air and handing on a balance beam or exploding out of the blocks in the 100-meter dash, three different coaches have similar reasons for Brookfield Central junior Lexi Romero's success. The Lancers 3-sport 'star' - note the last word - has gone to state with Coach Brian Scrobel's golf team, with Coach Erin Kokta's gymnastic team and with Coach Brian Calhoun's track & field team. "Her grandparents, her dad (Dennis) all were golfers," Scrobel said. "She transfers her athleticism to the golf course. She's strong, powerful, she generates so much power." Scrobel also brings her gymnastics skills into the picture. "There's a link to gymnastics on the beam, vault and bars," he said. "She so good at kinesics awareness. She knows where her body is, where her golf swing is. "For example, if she hits the ball into the trees off the tee, we have a plan. She will take 2-3 practice swings and almost on command, her muscle memory reproduces the shot." It didn't take Kokta long to see what she had in Lexi. 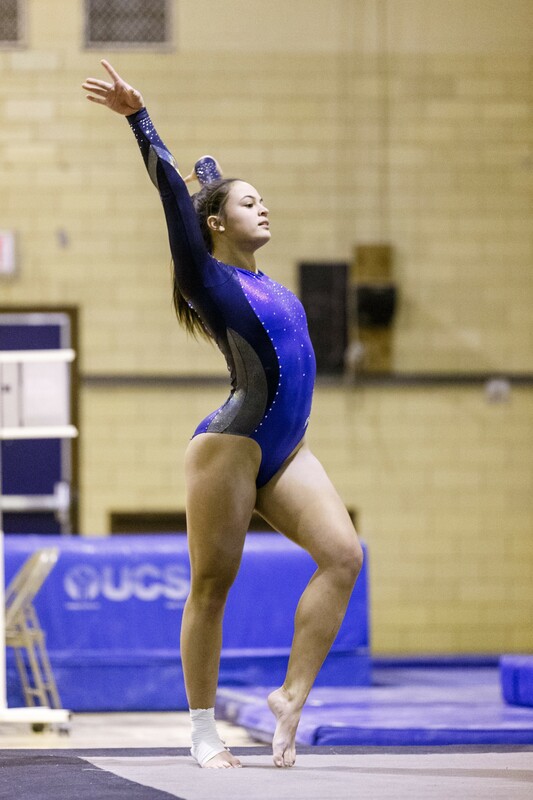 "She brings something different to the team as she is most powerful and explosive gymnast that has come through this program since I have been coaching," she said. "To put it very straight forward, Lexi is an 'athlete.' You can just look at her and know that she is going to a tough competitor in any sport. "I knew that Lexi was a special talent the moment she stepped onto the floor her first day of practice her freshman year. She walked onto a team that already had two established gymnasts in the state and instantly turned heads as a freshman and that says a lot." As for Calhoun, an outstanding track/football player himself, he agreed with Scrobel and Kokta on some of Lexi's strengths. "She's a student of the game," he said. "She wants to know the reasons, break down why we're doing it. She wants the smaller details most athletes do not understand or know. She really asks those questions. "'How can I cut off this much time? What do I have to do?" Most kids at this age, don't pay attention to it. Lexi feels she 'must know my P's and Q's.'" When asked what Lexi needed to work on to get better, brought Calhoun some hesitation. "That's a very tough question," Calhoun said. "She's already right there. Already strong, so she has to stay healthy. She is so involved in other sports. Her head is on a swivel. 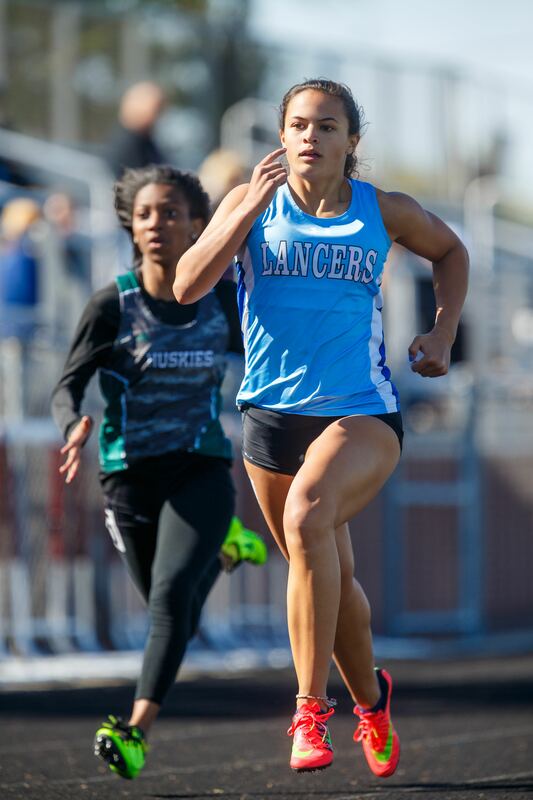 With more reps in track, the sky's the limit for her to do a lot of things well." Kokta pointed out Lexi's amazing gymnastics results when asked what she needs to work on. "I can't honestly say that Lexi has a 'weak' event," she said. "She has placed in the All-Around at state as a sophomore and this year as a junior. If it wasn't for an injury her freshman year, she would have been in the mix for All-Around that year as well. "In her three years on the team Lexi has made the state podium 9 times for 4 of the 5 possible events (Floor, Beam, Vault, All-Around). Her 9 times on the State podium is a team record, and she did that in only 3 years! So in short, Lexi's best events are all of them." Sometimes athletes need to work on the emotional part of their game - not Lexi according to Scrobel. "She tends not to get too wound up or up tight," the veteran coach said. "She has a calm down point. You don't find too many 3-sport athletes in high school who have been to state in three separate sports." What's amazing about Romero's track career is it didn't even get started until her freshman year at Central. It took until her freshman year because she was always involved in gymnastics. "Caitlin Locante (gymnastics teammate) is my good friend who was on the track team and she got me to go out for it," Lexi recalled. "I've always like sprinting. I've always raced my friends at school. The relays, it's been fun all these three years." Romero will run the 100 and 200-meter opens and take part in the 4x100 and 4x200 relays. "I enjoy the open 100 because it's like the shortest one," Lexi laughed. "It's not as tiring. You don't have to really deal with the handoffs - those can be stressful." Calhoun talked about what he and the coaches have in mind for her this season. "We'll try and map out different races," he said. "But she will run the open 100. She is also strong in the group relays 4x100, 4x200. She excels in the relays. "She enjoys running with teammates. Running with other girls there's a different purpose. She's running some fantastic relays for us. She runs the second leg, but we will dabble with her at anchor this year." Romero talked about her strengths and weaknesses on the track. "I like sprinting," she said. "I have the ability to keep going. Getting out of the blocks, being explosive. But I need to work on handoffs on relays. We have new girls who you have to get to know. We have to work on our outdoor handoffs and getting our endurance up." Having been involved in her sports for three seasons, Lexi will be looked at as a leader come her senior year. "I think it's important," she said. "I'm going to be the gymnastics captain for next year. I'm part of NHS (National Honor Society), it's a whole leadership club." "I want to make the freshman more comfortable; I'm aware of how everything works. I've always looked up to the seniors and everything they taught me. I've never been the oldest on a relay before. Now I teach them our traditions. For example, before every race we kiss the baton for good luck. I show them how to get our steps down, how to warm-up. It's fun." Kokta spoke about Romero's leadership skills. "She is truly modest in her success, and is the epitome of 'leads by example' by exuding hard work and dedication in all aspects of her life," she said. "Its because of these reasons that Lexi was selected by her teammates to be a captain in her senior year." Calhoun also feels Lexi sets an example as a leader, but is also accepting more of a hands-on role. "She is a leader by example," he said. "Our girls are supportive of each other. (Lexi) let's them know when it's time to run, to always keep their focus. But she keeps it light, so everyone is not too serious. She's being a leader, definitely accepting the role." Kokta talked about how Lexi's dedication goes beyond the athlete field. "Lexi's motivation is unlike many others," she said. "Her dedication to her work ethic is truly second to none, which is something that is certainly evident by her cumulative 4.0 GPA. "Lexi consistently demonstrates a mature attitude towards her accolades and strives to challenge herself as she has earned academic success in addition to her three varsity sports. Finding the balance between academics and athletics is something she does well as she has stressed high academic goals, putting success in the classroom as important as success in the gym." Scrobel was asked what is Romero like away from sports. "She's charming, delightful, the whole All-American girl. She makes everything fun." "She's a fun girl, likes to laugh, likes to joke a lot. I tell her 'You're one of best players in the state, yet you're down to earth.' She is so humble. Freshman through seniors can talk to her. That's a testament to her parents - they raised her right." "Lexi's personality is contagious and she has a way of connecting with her teammates," she said. "She brings joy and laughter to the gym everyday, sometimes too much laughter! I don't think I have ever seen Lexi in a bad mood. She is always happy go lucky. She knows when she needs to work and when to have fun. "If I had to give one word when I think of Lexi it would be laughter. She has the best laugh - it’s loud and genuine - that's the best kind." FAVORITE MOVIE: 'The Notebook' - Action, Horror. WHAT DO YOU DO TO RELAX? Netflix, Funny Videos on Youtube, Paint her nails. MOST MEMORABLE SPORTS MOMENT: Last fall golf team tied at sectionals for second, won playoff to go to state.